Tomato soup recipe – one of the popular soup recipes in Indian restaurants. This is my take on making the BEST restaurant style tomato soup. 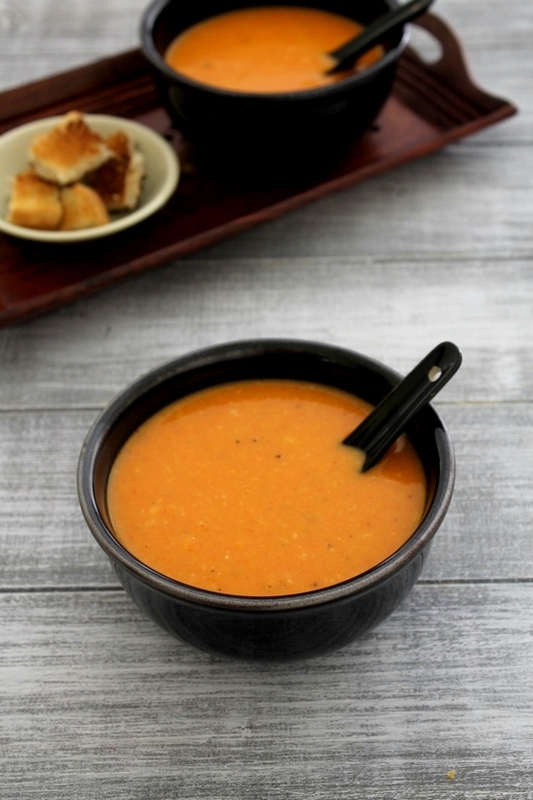 The key ingredient is tomatoes, so use the best, fresh, ripe tomatoes for making this soup. If unripe tomatoes are used then soup will be too sour. The white sauce is made first and then added pressure cooked onion-tomato-garlic puree. This white sauce makes the soup thick and creamy, buttery. So at the end, I have cut down the amount of heavy cream and added only ½ tablespoon of it for 2 servings only. There are two most popular soups in India – one is this one and second is indo-chinese hot and sour soup. You will find these two soups in any Indian restaurants menu. Among these two, tomato soup is ordered most by many. Just like many others, this is my favorite soup too. But not for hubby, he prefers chunky soup over smooth, creamy. I have seen many people uses beetroot or carrot to get the bright red color of the soup. I do not add those because I do not like the taste of it in tomato soup. If the fresh, ripe tomatoes are used then you will get bright orangey-red color from tomatoes itself. 2) Once it gets melted, add bay leaf and saute for a minute. 3) Then add chopped onions and garlic. Sprinkle little salt. 4) Cook till onions are soft and translucent or light pink in color. 5) Then add chopped tomatoes. 6) Add ½ cup of water. Cover the cooker with lid, put the weight on. and pressure cook it for 2 whistles. 7) Let the pressure go down by itself then open the lid. You will see almost mushy tomatoes. 8) Discard the bay leaf. Then grind it into smooth puree using grinder or blender. Here I have used hand blender. 9) Now strain the pureed tomato and discard the scrap. That is most probably not ground seeds and skin of tomatoes. You can skip this straining step as well. But I wanted to make smooth just like restaurant style, so I did one extra step. If you are using powerful blender like blendtec or ninja, you may not need to strain it. Since I have used hand blender I did strain it. 10) Now heat the ½ tablespoon of butter in pan on medium heat. 11) Once hot add all purpose flour. 12) Cook for a minute or two with stirring constantly. 13) Now add chilled/cold milk and mix well. I recommend to use milk right from the fridge, so there are no lumps. If using room temperature milk you will have lumps of all purpose flour. 14) Cook for 2-3 minutes or till it gets really thick like white sauce. 15) Then add strained puree slowly with constant stirring to avoid lumps. Let it come to a boil. If you notice that soup is too thick then you can add splash of water at this point. 16) Now add red chili powder, garam masala and black pepper powder. 18) Also add sugar.Mix and let it simmer for 2-3 minutes. 20) Stir well and turn off the stove. Tomato soup is ready to serve. Pour into serving bowl, serve with bread croutons. If you want, you can garnish it with little cream as well. Serving suggestion: Serve tomato soup with as a starter with croutons. To make it a light meal, it can be served with grilled sandwich or chili-cheese toast or a piece of baguette or bread sticks. Heat butter in a pressure cooker. Once it gets melted, add bay leaf and saute for a minute. Then add chopped onions and garlic. Sprinkle little salt. Cook till onions are soft and translucent. Then add chopped tomatoes and ½ cup of water. Cover the cooker with lid, put the weight on. and pressure cook it for 2 whistles. Let the pressure go down by itself then open the lid. You will see almost mushy tomatoes. Discard the bay leaf. Then grind it into smooth puree using grinder or blender. Now strain the pureed tomato and discard the scrap. That is most probably not ground seeds and skin of tomatoes. You can skip this straining step as well. But I wanted to make smooth just like restaurant style, so I did one extra step. If you are using powerful blender like blendtec or ninja, you may not need to strain it. Since I have used hand blender I did strain it. Now heat the ½ tablespoon of butter in pan on medium heat. Once hot add all purpose flour. Cook for a minute or two with stirring constantly. Now add chilled/cold milk and mix well. Cook for 2-3 minutes or till it gets really thick like white sauce. Then add strained puree slowly with constant stirring to avoid lumps. Let it come to a boil. If you notice that soup is too thick then you can add splash of water at this point. Now add red chili powder, garam masala and black pepper powder. Stir well. Also add sugar. Mix and let it simmer for 2-3 minutes. 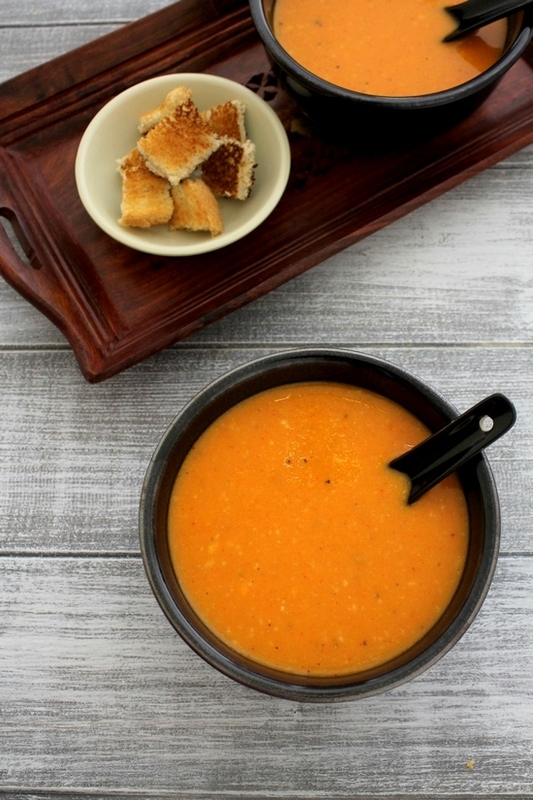 Thanks so much for this South Indian Tomato Soup recipe. I’ve been getting this soup at a nearby Indian restaurant and always take some home to have in my freezer in addition to eating it at the restaurant. They must have had someone new in the kitchen last time I was there, though, as the soup was utterly bland and tasted of nothing except tomatoes and water. Today I took the container out of the freezer and, going by your recipe, added garlic powder, onion powder, chili powder, black pepper, and curry powder. Since I’m not supposed to have sugar, I also added a little luo han guo (monk fruit powder), which, like stevia, doesn’t fuel pathogenic organisms. I didn’t have bay leaf so couldn’t add that. But the soup was delicious, even without it, and tasted quite a bit like the soup I used to love at my neighborhood Indian restaurant. Indian food is my favorite kind of food! Glad to know that you liked this recipe. Thank you for sharing detailed feedback that may help others. Thank you Kalpana. But I do not share my recipes other than my own platforms. Sorry about that.